SO, WHO OR WHAT IS, ARBONNE? Arbonne started it’s story more than thirty years ago by a gentleman by the name of Peter Morck, who had a huge passion for beauty and that he wanted to develop botanically based products around three words: pure, safe and beneficial. Beneficial: that the product will actually make a difference to your skin’s appearance. Arbonne can only be purchased through an Arbonne consultant (its kind of similar in the way to Avon, Nutrimetics etc). They sell through network marketing or online from their own website but if you are wanting to purchase the products on your own, you still can but you might still be allocated an independent consultant once you have made your first online order. Now I’ve been trialing the FC5 range for the past few weeks and I have to say I am impressed with the range. This range is specifically targeted for those with oily to combination skin as they both contain a specified formula, which Arbonne refers to as “Matte Fresh Complex” to ‘combat unwanted oil’. 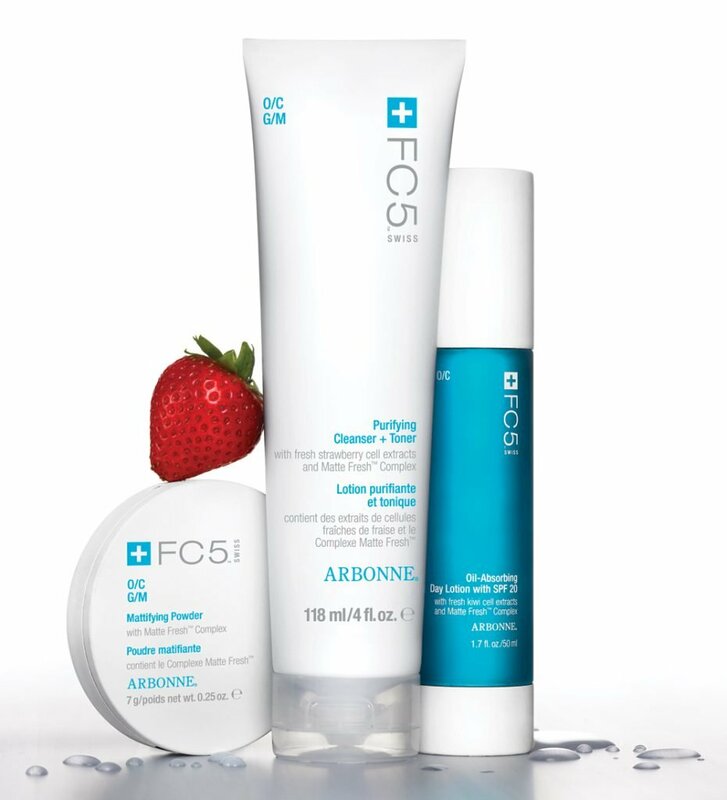 FC5 means ‘fresh cell technology incorporating 5 fruits and vegetables’ to help and maintain the radiant healthy looking skin through hydration, moisturisation, cleansing, exfoliation and sun protection. To be honest it was weird at first to grasp the thought of a cleanser and toner in one, as I am only used to using only a cleanser and a toner on its on and not as a two in one. But the more I used this product daily, I realised it was a genius move! Now this product is for oily/combination skin so it works for me perfectly as I have the standard T zone: little oily on the forehead and down the nose & chin. My definition of a cleanser is that it’s supposed to clean my skin thoroughly: no make-up to be left behind and it shouldn’t dry out my skin either. This lightweight moisturiser helps to absorb oil and stop over-oil production throughout the day but also provides sun protection by the leaving skin with a fresh, matte appearance. It has a really lovely fruity fragrance when you’re applying it all over your face with two of the main key ingredients being the fresh kiwi cells and grapeseed oil. You only need the size of a pea when you’re applying the moisturiser and your face just soaks it up and honestly I felt really lovely once it was done. The only downside of this product I have to say is that its so expensive. Yes you can make it last a while by only applying a small amount (.i.e. size of a pea) however the size of it that it come’s in is 50ml which is a standard size for most day creams. But when you’re on a tight budget, it does change your willingness to pay that exhurberant amount of money. I would suggest perhaps buying the product in a pack or asking your Arbonne consultant if they have any special offers on at that moment so that you get your value for your money and more than just one product. I am a huge believer in exfoliating and have been doing so for many years, exfoliating up to 4 – 5 times a week. Christie Brinkley (80’s supermodel and ex-wife of Billy Joel) is also a huge fan of it and swears by exfoliation every day (explains why she looks freaking amazing!). Exfoliation is one of the most important things that you should be adding to your skin care regime. Exfoliation involves by removing the oldest dead skin cells on the surface of your skin, and by do this you can purchase any type of facial scrubs that are out on the market but just need to find the one that isn’t too harsh and/or dries the skin on your face. I personally use St. Ives and absolutely love the feeling of my skin afterwards, feeling so clean, smooth and radiant. This Arbonne has a really lovely fruity fragrance while your exfoliating your face, with the main key ingredients being the fresh kiwi cells and shea butter. But to be really honest with you, while I think the Arbonne scrub is a good product, it just didn’t give me that ‘wow’ feeling. And for the price of it, I don’t think it does more for my face than what my St. Ives scrub does and St. Ives also uses all natural ingredients. Don’t get me wrong I’m not dismissing the product, it does exfoliate my skin and it doesn’t dry it out and it is suitable for all skin types. I like it, but I’m not convinced it does more than other scrubs I’ve used in the past, and for the price, I really just can’t justify it. Let me just begin and say, it is NEVER too soon (or too late!) to start using eye creams. It is so important to incorporate this into your skin care regime. I started using eye creams in my early 20’s and haven’t stopped since. To be honest, I am always on the look out for that mind blowing eye cream. It has a really lovely fruity fragrance when you’re applying it under your eye with two of the main key ingredients being the fresh kiwi cells and shea butter. You only need a small amount, and gently pat with your index finger, back and forward. Afterwards I could see the under eye skin soaked up the cream, not leaving behind a greasy residue. This eye cream is really lovely, it hydrates, minimises dark circles and fine lines and leaves your eye area feeling fresh and revitalised. After a week of using this product, I will say this cream is brilliant for rehydrating the under-eye area! * This post features items that were provided to me for my editorial consideration in accordance with my Disclosure policy. Would I use Arbonne again? Yeah, probably but I don’t think I would actually purchase it. I find that their products are extremely impressive and apart from being vegan, GMO, paraben free and not tested on animals, I have seen results after a few weeks of using their products. The only down fall for me with Arbonne is their expensive price range and not everyone can afford it. However, if there are certain products in their range that you do want to get but you’re on a tight financial budget then I would suggest perhaps buying the product that come’s in a pack or asking your Arbonne consultant if they have any special offers on at that moment so that you get your value for your money. For all of my Australian readers that want to order the FC5 range or any other product from the Arbonne range, please contact Alana Poli or Kate Murray and both will look after you, and suggest the right products for you & get you set on your Arbonne journey. So tell me what is your skin care regime? Would you consider trying out Arbonne? Or do you use Arbonne products, and what products are they? Does it work for you?